My thanks to Les Ronan for the information regarding this very smart looking Bedford OB with its classic Duple body. Apparently this was the only vehicle owned by Victoria Coaches at the time this shot was taken. Victoria Coaches was owned by W E Kelly 39 Arbory Street Castletown Isle of Man who was probably the owner driver. It is hard to date this particular vehicle by its registration as LMN started May 1949 and ended March 1968. I have found out that IOM road services had a vehicle LMN 147 dated 1949 and another LMN 546 dated 1949 so was the Bedford above LMN 216 new 1949. If you know please leave a comment. The coach was new in 1949 and it is it’s original registration. I drove it. 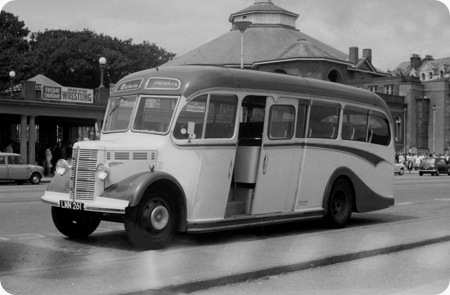 The IOM buses were also acquired in 1949. This information is incorrect my Father the late Arthur Corkish owned Victoria Coaches on the Isle of Man operating from the War Memorial in Douglas where this photograph is taken. This is one of his coaches. He built the business up to 4 plus a taxi, minibus and a haulage Lorry. He operated in the 50’s until the early to mid 80’s when he sold his business to Harry Midgehall of Fairy Cottage Laxey. Mr Midgehall sold out to Tours (Isle of Man) Limited not long after. The coach was new as LMN 261 in July 1949 to E Bryan, Douglas, Trading as Tynwald Motors. It was fleet number 2. to T.W. Bryan, Douglas 6/53; to M. R. Fargher, Peel 2/60; to H.B. Clague, Douglas 5/63; to M.J. Corkish, Douglas 4/66; to Downward, Douglas 12/67; w/d 11/68; to contractor’s site office, Onchan 11/68; scrapped ?/? ?